rec. live, Musikhuset Aarhus 3 Nov 2004. 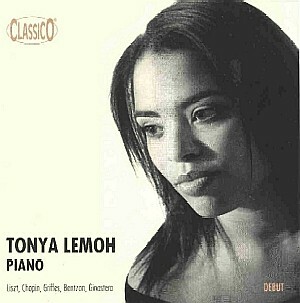 What we have here is Tonya Lemoh's d�but concert complete. With the tension of a live event - and such an important one - we also get occasional shufflings and clearing of throats by the audience. Lemoh�s Vall�e d'Obermann is unhurried and fashioned in the spirit of Pushkin and Onegin. In this she is extremely successful though less, so I fear, in Griffes� White Peacock which is wanting in mystery. Its languor seems too casual. By contrast the third of Griffes� Four Roman Sketches, The Fountain of the Acqua Paola is more successful in florid Lisztian style. Lemoh's coup in this her first CD and her debut concert in public is the eight movement suite by Niels Viggo Bentzon. This piece was performed as an improvisation by Bentzon at Roskilde Cathedral in the 1970s. John Damgaard acquired a recording of that event and passed this to Tonya Lemoh and her husband the jazz pianist Thomas Walburn who transcribed the work from tape. Bentzon gave his blessing to the making of the transcription. The resulting eight movement suite has a warmly monumental clarity and in its pages we meet the sharply etched spirits of Bach, Bartok and Debussy. There�s no room for the dissonance of the Symphonic Variations (recently recorded on ClassicO and reviewed on this site). Every page is fixed with music of honest precision yet imbued with lively fantasy. Shostakovich may also be invoked here and he certainly seems a presence in the Courante and the final Gigue.� The R�jouissance flies with hectic wings borrowed from Conlon Nancarrow. Lemoh is totally in command and the music flows with great and natural force. Very impressive. After what I found a curiously uninvolving Chopin piano sonata things improved multifold for Ginastera's Danzas Argentinas. The highlight came in the shifting half-lights and mezzotints of the Danza de la moza donosa with its insubstantial hints of tango, smoke and La Valse. The evocation of black pattering angst-driven rain in Danza del gaucho matrero is really striking and even more so in the final hustle-bustle which draws on Cowell and Ornstein. Brilliantly done. The envoi is the cool and calming Bach-Busoni with just that romantic patina lent by Busoni. This is the right piece to send the audience out into the Aarhus streets self-possessed and reflective. Ms Lemoh is a doughty and imaginative pianist and her approach to choice of music is to be applauded and strongly encouraged. I hope we will hear more from her in Ginastera, John Foulds (she would be wonderful in April-England and the Essays in the Modes), Ornstein, Cowell, Ronald Stevenson, Grainger, Nancarrow, Shostakovich and of course more Bentzon. How about the complete Bentzon piano concertos? An auspicious if not unmixed debut - outstanding in Bentzon, Liszt and Ginastera.